Halloween Office Décor is Fun! Whether at home or at the office, add some Halloween spirit to the atmosphere by decorating everywhere. Themed mouse pads and office décor will get you in the mood for some trick or treat fun. Regardless your taste, whether you prefer scary, artistic, or adorable, you can find office décor that meets your requirements. As a necessity, the mouse pad may not often be considered when decorating for special occasions. That is unfortunate. There are so many striking images available on Halloween mouse pads. From the almost mundane cats and JackoLantern pumpkins, to the ethereal fairies, ghosts, and witches, the breadth and artistic styles on these pads is amazing. My favorite Halloween mouse pad with the old haunted house is displayed to the right of this article. It has a dream like quality that I find both interesting and a bit disconcerting. When I was a child, I lived in an old house that looked very much like this one. At the time, I was convinced it was haunted, though I don't remember ever actually seeing a ghost. I did, however, hear lots of shrieking winds, wolves howling, owls hooting, and boards creaking. 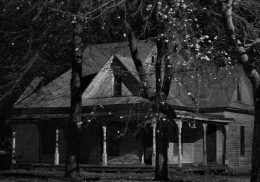 Going to sleep in that old house was truly an ordeal every night. old house was a nightly ordeal! After you purchase your favorite Halloween Mouse Pad to decorate your computer, don't forget your monitor. Perch these three skeleton figures atop your work monitor to watch the ghoulish fun begin! Do you decorate the office for Halloween?